Over the past years Alena has cooked so many different and delicious things for me that no restaurant can compare or compete. All this time I have been taking pictures, and Alena posted some of them, but a lot of them were collecting virtual dust in the depth of our hard drive folder structures. I decided to put them all together in a separate gallery and make it public. I’m sure Alena will be glad to share a recipe in case somebody likes how something looks like. Just ask. Seeing all these pictures kind of makes me happy. At the same time now I wish that we would have taken pictures of ALL the stuff that I cooked. Can I come when you cook again? I was waiting for some kind of Okroshka comment. Strangely enough we have no pictures of it. I guess there really is nothing to photograph. But yeah, you sure got dibs on Okroshka. I just found this site looking for a picture of a proper plov to show my mother. This one looked great! Alina, the chicken Kiev looks fantastic. How do you make it? David, thank you for the compliments! I’ll make a post about chicken Kiev later this week (have to translate the recipe from Russian). And it’s Alena, not Alina. Wow.. I can’t read.. Sorry Alena. Anyways, I’ll check back for a recipe later. I’ve been trying to come up with some permanent domain name for my and family personal sites and e-mails with no results for a while now. Yesterday I mentioned this to Artem, who immediately registered his last name as a domain. Lucky him. Mine (last name and all possible variations) were taken a long time ago. Artem proceeded to hook up his domain to Google Apps per my suggestion, which was exactly what I wanted to do. E-mail on my own domain through Gmail interface. For free too. Either way, I pretty much gave up on the “name” domain and complained about it to Alex. 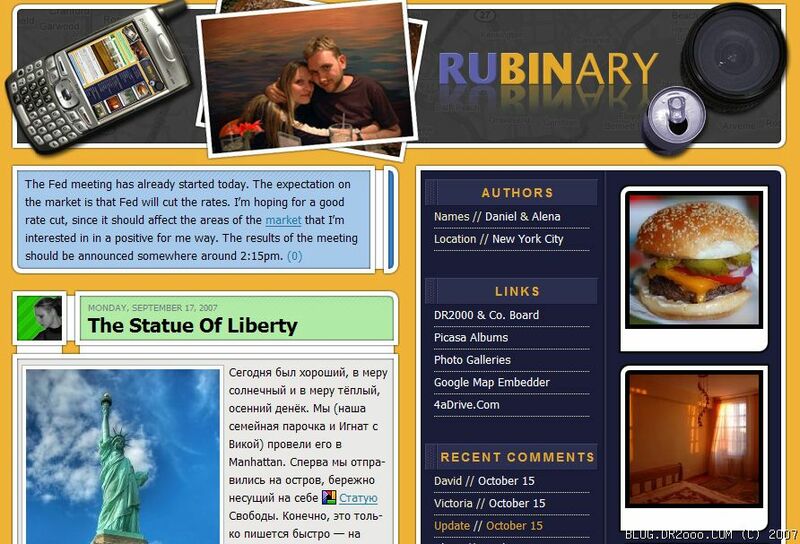 He spent a while coming up with all kinds of ideas when in the end he came up with a bit of gem: rubinary.com. It’s the next best thing to rubin.com itself, I think. Has a name in it with a suffix which suggests a place for Rubins (as in planetary), and has a word binary in it. This is a binary — digital — virtual ‘verse we’re in after all, right? This is where it all ended. Domain is registered and that’s what I’m going to stick to for the foreseeable future. All the members of the family are hooked up with personal emails as well. Those who know me well won’t have a problem figuring out what my new e-mail is. P.S. Looks like Alex ended up with a domain of his own after all too. P.P.S. No more confusion with zeros in DR2ooo.com. New domain points to this blog as well. Not gonna use this for personal sites and email though… Just set up an cover page and a web counter. Who knows, if millions of people start flocking to it, I’ll make the product. You know you want it! I can feel the breath of autumn on my skin. It makes me sad, because the warmth of summer is over. It brings the feeling of anticipation, because I love golden beauty of the nature getting ready for dormant months (the leaves are still mostly green tough). 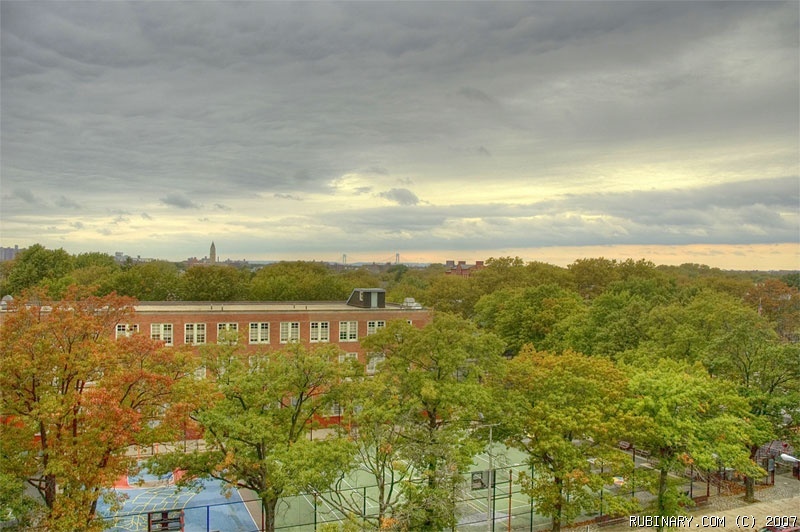 Autumn used to smell for me like crispy apples, rain, wet oak-trees, decaying colorful leaves, and fresh chestnuts. Now I’m not sure anymore. Need to try to figure the New York’s autumn scent out. Я тоже осенью всегда вспоминаю о Минске. Первое сентября, желтые клёны, антоновские яблоки, ожидание холодов, колючие ёжики каштанов (помнишь, как много каштановых деревьев в Минске? ), шуршащие листья под ногами… А еще день рождения. Он мирит меня с ноябрём. Но ноябрь- это уже совсем другая осень – холодная, голая, серая. yes, i am a sap. The Notebook made both of us cry too. I’ve noticed that having kids makes you cry more in movies. I spent all my nights and weekends of the past week or two on a new design for the site. 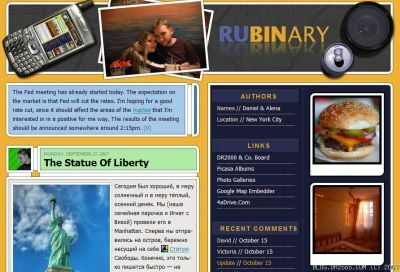 I felt it was about the right time to refresh the blog style and make something with the new domain name in mind. First I built a concept in Photoshop. After I was happy with it I cut the images and put down some code. I haven’t used a single table and did everything using CSS. Now that the site is pretty much done, with the exception of small details I find it that I’m liking it less and less. I’ve been contemplating killing the redesign for the past 2 days, while trying to improve some of the things that I didn’t like. Now I’ve made the decision. The final product is not good enough. Not my kind of thing I guess. I figured I’ll post the screenshot of whole thing anyway, considering how much time I spent on it. This recipe was also provided by one of the very talented housewives of kuking.net – Иша. I tried a couple of her other recipes, but this one is probably my favorite from her repertoire. 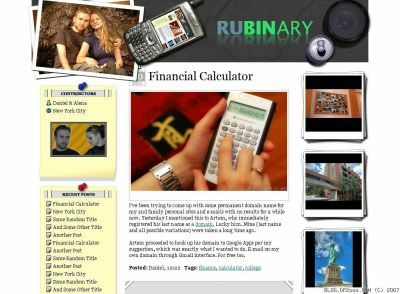 After many more evenings and sleepless nights I’m actually very excited to introduce a new version of the blog design. As you can see I’ve reused several elements from the design that I have decided to scrap, but everything else is brand new. I for one am very happy with the end result. It’s a far superior product compared to the one that I decided not to use. I would very much like to hear your opinions about this. Things you like, things you don’t like, compliments and constructive criticism, if you notice some glitches or problems. Everything is welcome. I hope you’ll take a couple of moments and leave a comment. On the tech side of things I want to say that this is my first site with no tables. Everything is done through CSS. Firefox is a great browser, and if you’re not using it yet, you should switch. IE on the other hand took hours upon hours to get right. Also not a single pixel was “borrowed” from somebody, 100% of work was done by me. Anyhow, as I said, I’m very happy with the end result and I’m waiting for your comments! Hey man! Congrats with release, looks pretty neat! Thanks, I tried. Try turning off CSS. Or click on the photo of Alena and I on the top. New design looks really nice. I like it. Yeah, people didn’t understand why Snapple was there Geoff mentioned that somebody’s brand was too prominently shown next to our own logo. The can is that of a Red Bull. Much cooler then Snapple. You discarded a Snapple bottle?! NooooooooOOOo! Nice touch on the comment boxes. Very cool. Makes me wonder… what if the number of comments shoots over 99999999? Well, only one way to find out. Yeah, not going to happen! By the way, this comment design was what made me discard the first attempt. It came out too cool looking, and everything else started looking “not so hot”. Beautiful design work! I plan to steal it all for my upcoming site Katzylvania.com and take credit for it, hope you don’t mind. Not at all, you can have all HTML code. As long as you leave the CSS alone. Well, I think that I should chime in too. I already told Danya – I really like the design. My husband makes me proud. Hey guys, really cool new look, very fresh and interesting. I really like it. Yesterday was a fun day. Well, apart from the visit to the ophthalmologist in order to figure out what’s going on with Danya’s eye (the diagnosis is “floaters”). 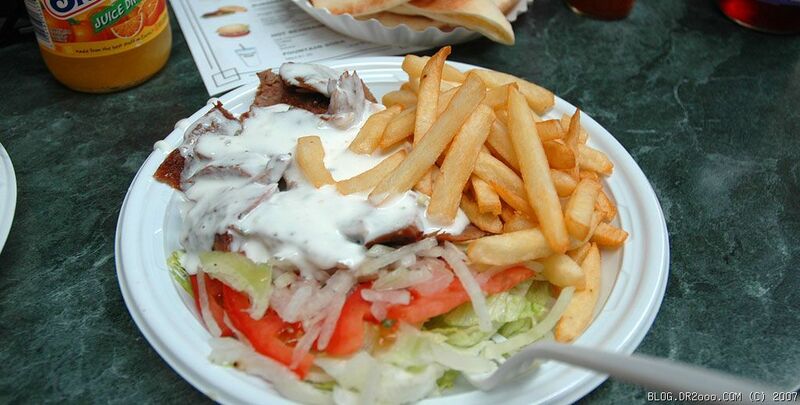 Gyro tam xoroshoe. V starit vremena mi tyda na mashine za gyrom ecdili. Etot place ctoit $7 kak ya pomnu. Уже $8.50 с Snapple. Инфляция. Btw, about that diagnosis… Floaters is the symptom, not the cause. It’s like going to a doctor and complaining that your leg hurts, and the doctor would say “well what you got there is leg pain”. I find it very strange when doctors say stuff like that, but I guess I’m not really surprised. I’ve been told by doctors that my chipped tooth will grow back, and that “it’s not acne, it’s pimples”. I’m going to try to see another doctor tomorrow. She checked my eyes and said that she doesn’t see anything serious like “retinal detachment”, but I better make sure, even though I do have 2 eyes. Nah, I’m sure she’s right that it’s nothing serious. Unless it gets worse, stick with that. I just don’t understand why they give the name of the symptom as diagnosis. Maybe “floaters” sounds less scary than something like “posterior vitreous detachment”. A couple of weeks ago I was browsing through some old photos and I’ve stumbled upon this little gem. The photo was taken during our Phoenix, Sedona, Grand Canyon, Las Vegas trip somewhere in October of 2005. 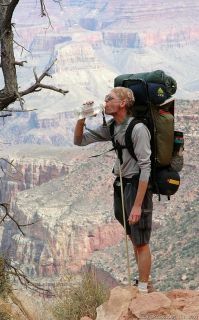 The hiker was just coming up from the bottom of Grand Canyon after a several day stay there. He said that after he’s been to the bottom once he fell in love with Grand Canyon all over again and has been doing this hike every year since. To those of you who haven’t seen Grand Canyon — you just must. There is just nothing like it anywhere on this planet. One of these days we must look at it from the bottom ourselves as well. Above is a result of a small experiment I tried yesterday. Took a single shot from our window in RAW format. Put the file into Photoshop and saved 3 version of it — normal, underexposed and overexposed. After that I put them in Photomatix and generated an HDR image. Pretty good results for something as simple, I think.